A leading Hillsborough campaigner has welcomed the Football Association's acceptance of a key report into the 1989 disaster. MP Steve Rotherham said he was "delighted" FA chairman David Bernstein had accepted the Hillsborough Independent Panel (HIP) findings. The HIP report, published last month, outlines how Hillsborough did not possess a valid safety certificate at the time of Liverpool's FA Cup semi-final game and how "the risks were known and the crush in 1989 was foreseeable" to, specifically, Sheffield Wednesday, its safety consultants, the local authority and the South Yorkshire police. 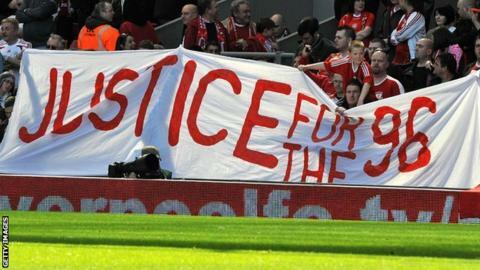 It said police changed statements and tried to blame fans for a crush that led to the deaths of 96 Liverpool fans. When asked if the FA entirely accepted the report, Bernstein said: "I think we would accept the findings of the panel. "We accepted the findings of the Taylor Report and we accept the findings of the independent panel. "I think we have to see what process there is going forward and we'll respect that process." Lord Justice Taylor's report into the disaster, published in 1990, stated that South Yorkshire Police's actions were the main cause and that the FA's choice of ground for Liverpool's match against Nottingham Forest was not itself "causative". Rotherham, MP for the Walton constituency, which incorporates Liverpool FC's Anfield stadium, said: "I am delighted that the FA accept the findings of the HIP report and I assume that they will now fully cooperate with the Director of Public Prosecutions (DPP) as he investigates what happened in the lead-up to the disaster on 15 April, 1989. "It will be for the DPP to determine whether or not there is enough evidence to bring forward charges of corporate manslaughter, but as we wait for that decision, I am pleased that the FA are finally beginning to accept their part in the deadly decisions that led to the disaster at Hillsborough." Keir Starmer QC, the director of public prosecutions, announced earlier this month that he is to review all the material now available in relation to Hillsborough to see if there is "sufficient evidence to charge any individual or corporate body with any criminal offence". That decision leaves open the possibility of corporate manslaughter charges being potentially brought against organisations such as The FA, Sheffield Wednesday FC and South Yorkshire Police. In a Parliamentary debate on Monday, former health secretary Andy Burnham MP stated he believes the FA has a case to answer given they were the organisers of the tie. "The hirer of Hillsborough and its owner both had a duty of care, a basic responsibility to ensure a semi-final venue had an up-to-date safety certificate," Burnham said. "The failure, in my view, was grossly negligent, as was the failure to act on warnings and complaints." Bernstein apologised for Hillsborough on behalf of the FA last month, saying: "We are deeply sorry this tragedy occurred at a venue the FA selected. "This fixture was played in the FA's own competition, and on behalf of the Football Association I offer a full and unreserved apology and express sincere condolences to all of the families of those who lost their lives and to everyone connected to the city of Liverpool and Liverpool Football Club. "This should never have happened. Nobody should lose their lives when setting out to attend a football match and it is a matter of extreme regret and sadness that it has taken so long for these findings to be published and the truth to be told." Speaking on Tuesday, Bernstein reiterated that apology adding: "Hillsborough was probably one of the most terrible incidents in football in this country. "We emphasise that we have cooperated absolutely and fully with the recent inquiry. We have said, and I will ensure, that we absolutely cooperate with any further inquiry. That is absolutely key."